The main activities carried out at the Competence Centre in Reutlingen include the development, design and mass production of tooling. Modern processing centres with machine tools, sanding machines and milling machines support efficient construction. High-accuracy measurement and inspection systems guarantee precise tolerances and ensure high levels of quality in mass production. Autodesk Moldflow for process simulations. During the processing, high-precision optic surfaces are carefully incorporated in the tooling. Tests are carried out with injection machines by highly qualified personnel using special parameters that can be adjusted thanks to the measuring instrument. 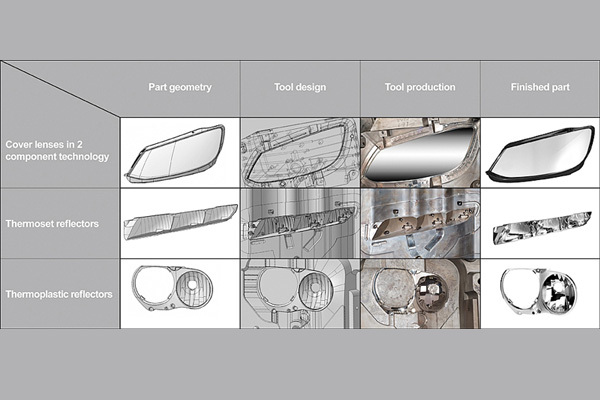 Based on the validation of equipment, processes and parts, the type-approved tooling is issued to the pertinent production facilities for mass production in the entire worldwide production network of Automotive Lightning.